Lady on the left? My great-grandmother. She would have been ninety-eight today. The photo was taken in the early 1950s outside her cottage and she is with two of her sons, K and T.
I was lucky enough to grow up around her. She looked after me when I was pre-kindergarten and I spent most of my school holidays in her cottage. Her cottage did not have running water until I was maybe seven or eight and never got central heating. I can still envision her sitting in her chair in front of the kerosene-fuelled stove. 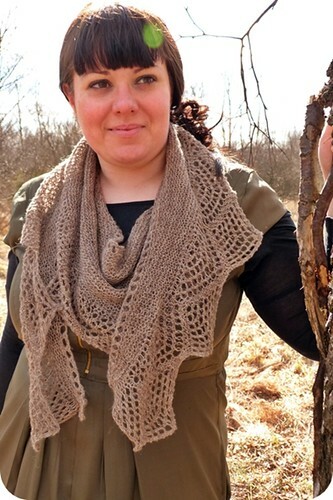 She'd knit long garter stitch strips from yarn scraps and sew them into blankets. I think she was the one who taught me to knit. She was certainly the one who taught me how to skip rope. Title comes from this beautiful farewell song (youtube link). Post reposted from 2009, 2010, 2011, and 2012 with Momse's age amended. I continue to miss her. Casa Bookish was hit by runny noses and sore throats this week. The affliction resulted in two things: a lot of books being read and some impromptu dress-making. The dress in question is still a work in progress. It's based upon Simplicity 2925, view A but I cannot be trusted to do anything by the book - not even sewing. I did away with some ruffles, altered the yoke/neckline and I'm adding buttons where there are no buttons. Rebel. The fabric is a very light polycotton from Mandors. I fell in love with the subtle geometric print and the black/dark green/cream colours. It won't keep me warm, but it will be a great layering piece (once I finish it - the basic construction is done, but the small bits are not). I have become aware that I'm increasingly dressing like an art teacher. A very Danish art teacher with restrained colour schemes and attention to details - but an art teacher nonetheless. Making more of my own clothes will not - will not - curb that tendency. Meanwhile, as some of you may know, The Huffington Post published a blog post about knitting and baking betraying the feminist movement. The post itself read like someone had taken a Feminism 101 class and just scraping home a pass (because the teacher was in a good mood having devoured a home-baked cup cake). The responses to the post were far more interesting. This one is one of my favourites so far: succinct, humorous, and blunt. Any recommendations for more smart, funny, self-aware responses? On the agenda: getting better, saving Other Half from the plague, choosing non-functioning buttons for the dress, cooking dinner (soup?) and reading my book. It's a hard life. My first birthday present was given to me today by David (a day early!). I was so thrilled when I realised it was a ticket to see Mr Rufus Wainwright live later this year. I have seen Rufus on three earlier occasions, but this one will be just him and a piano. Cor. Now to wait a few more hours before I can start to unwrap the rest of my presents. Whee. Just a little peek of my just-off-the-blocking-board shawl. It's beautiful, it's warm and it's mine. Sorry. I notice how my projects travel by colour. I had a green phase last spring/summer, then recently I have knitted a lot of blue-ish purples and pink fuschia, and now I appear to gravitate towards rich reds. I hope I will never have a pastel phase. I do not think I'd be able to keep my sanity. Anyway, proper photos to come this weekend after Official Photographer and I manage to have a full day together. Official Photographer called me this morning to let me know that Crowded House will be touring the UK this spring and that tickets go on sale tomorrow. I have written about this before, so it suffices to say that Crowded House provided the soundtrack to most of my life. I connect places I have lived or been with their songs, and although I no longer listen to them on a regular basis, they are "my band". For one glorious moment I contemplated seeing every Scottish gig, but then I checked ticket prices and also remembered that I will be on my way to West Yorkshire for work reasons when they play Aberdeen. If you had told me ten years ago I would have to forego seeing Neil Finn live for matters involving sheep, I would have thought you mad. Anna has written an interesting post about her relationship with "things", crafting and feminism. I enjoyed reading it. You may too.